It is now less than a week until Jack-in-the-Green awakes! If you are going to a Jack-in-the-Green event this year it would be great to make the most of the wonders of technology and post details of sightings of Jack as they occur. Please do e-mail me pictures and I will attempt to post live updates to this blog. If you are a technophobe please don’t feel left out. It would be great to get pictures and personal accounts of as many of these events as possible for our archives. All pictures that are used on the blog or added to the Flickr archive are copyrighted to the original photographer and are never reproduced without prior permission. 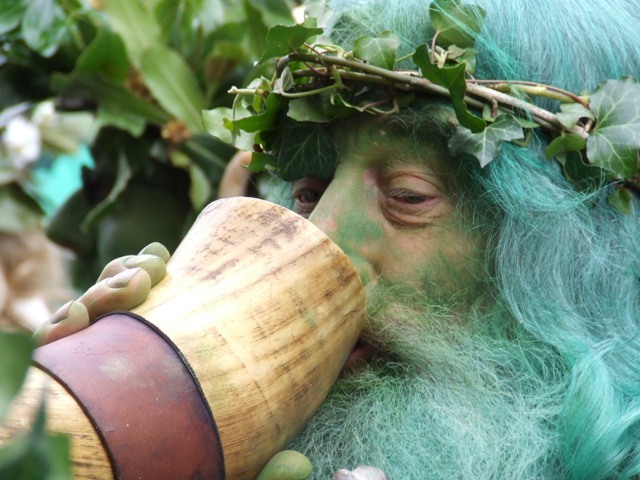 Our aim is to provide a living archive of all the wonderful traditional Jack-in-the-Green events that take place every year. If you are thinking of going to an event please do drop me a line to let me know and please consider taking an extra picture of Jack for our archives. And if you know of a Jack-in-the-Green or Green Man event that I have missed or that has just started please do let me know. The Knutsford Jack in the Green is probably the oldest continual annual Jack in the Green. Apart from the war years it has paraded every year since 1889. May Day in Knutsford (Cheshire) is celebrated over the May Bank holiday weekend. The main focus is the May Queen. The person who plays Jack is chosen each year and is now played by a youngster rather than an adult as it used to be. 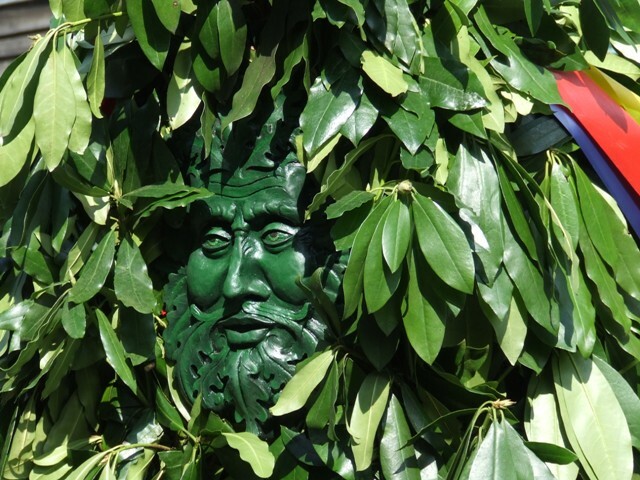 Brentham Jack-in-the-Green Brentham has a big celebration every May which includes a Jack in the Green described as a walking talking bush who sometimes parades barefoot. 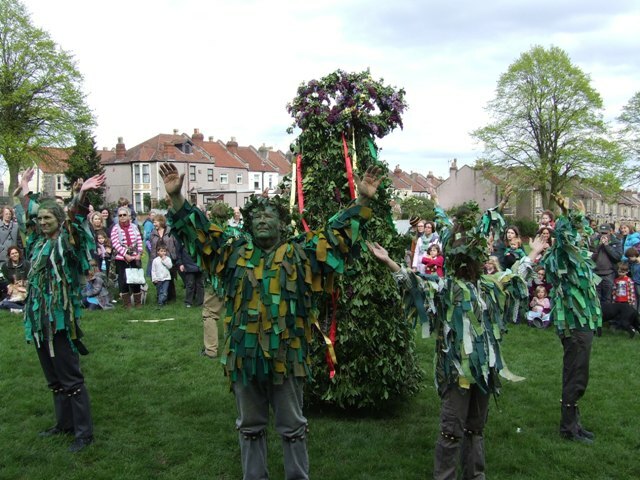 Brentham’s May Day tradition became established in 1919 after the end of the First World War and expanded considerably for 1921 when the first Jack-in-the-Green appeared. The Oxford Jack-in-the-Green appears in Oxford on May Morning. OUMM (Oxford University Morris Men) introduced Jack-in-the-Green to their May Morning festivities in 1951. At that time they were unaware that a Jack-in-the-Green was a common sight in and around Oxford in the 19th century. The Oxford Jack is usually first seen near Magdalen Tower just before 6am and leads an informal procession up ‘The High’ to Radcliffe Square, where the first dance of the day: “Bonny Green” from Bucknell, starts at about 6.25am. Jack then moves through New College Lane and Broad Street, concluding with a massed ‘Bonny Green Garters’ outside St. John’s College in St. Giles around 8.30am. After breakfast the University & City Men usually take Jack to a display for the children of St. Ebbe’s school when May Morning falls on a weekday. Known as The Guildford Bush, this Jack is accompanied by the Pilgrim Morris Men of Guildford. They meet at the bottom of the High street and process to Holy Trinity Church with the Maypole. The Maypole is erected on Castle Green and the dancing involving guest Morris sides begins. This Jack was revived in 1976 by The Pilgrim Morris and is built from Laurel. For many years the Jack was carried by folklorist George Frampton. The Fowlers Troop Jack was revived in the early 1980s by members of the Blackheath Morris Men and friends. It is a revival of a Jack in the Green from about 1900 which was paraded by the original Fowlers Troop. The Fowlers Jack goes out on the streets of South East London or the City of London each May Day. The Jack is usually dressed on April 30th. Rather than a revival, The City of London Jack-in-the-Green is based on descriptions and illustrations from early writings. The City of London Jack was first paraded in 1984. Tradition has it that the City of London Jack only comes out on City working days, on years when this is not the case it is rumoured that the City of London Jack may occasionally be spotted elsewhere. The City Jack did not go out in 2013 but many of his followers joined the Deptford Jack. The Rochester Jack was revived in 1981 by Gordon Newton from accounts by Charles Dickens and is still part of the Annual Sweeps Festival. Originally revived by Boughton Monchelsea Morris, custodianship of Jack was passed to Motley Morris in 1984 who now Wake Jack with various other Morris sides at dawn on May Morning (approximately 5:32am) at the Bluebell Hill picnic area surrounded by twelve bonfires. Jack is paraded through the streets of Rochester usually on the bank holiday Monday as part of the Sweeps Festival. The Hastings Jack-in-the-Green festival was revived by Keith Leech in 1983 and is now one of the biggest annual gatherings of Morris Dancers in the country. The Jack is “released” every year and is central to the festival. The main procession of the Jack takes place on the bank holiday Monday through the streets of Hastings Old Town starting from the Fishermans Museum. The Jack is accompanied by Mad Jacks Morris, the Green Bogies, dancers, giants, musicians and various others. At the end of the day Jack is slain to release the spirit of summer. A Jack-in-the-Green was recorded in Bristol around 1865 by a lady who remembered seeing him with a sweep and a queen on the outskirts. The revived Bristol Jack in the Green is a descendant of the Hastings Jack and appears on the first Saturday in May starting from the historic Harbourside (outside the M Shed) and leads a magical procession through the streets of Bristol eventually ending the day on Horfield Common where he is slain to release the spirit of summer. Ilfracombes Jack-in-the-Green was started in 2000 by Lisa Sture. A procession starts at approximately 11am winds its way through the High Street, along the sea front towards the harbour area where children and Morris Men dance around a Maypole. Another descendant of the Hastings Jack the Ilfracombe Jack event also finishes with the release of the spirit of summer and the distribution of leaves on Ilfracombe Pier. The High Wycombe Jack has appeared in one form or another on Holywell Mead between 2005 and 2010 he did not appear in 2011 but in 2012 was sighted on Naphill Common. There were no reported sightings in 2013. Highworth in Wiltshire celebrated it’s 800th anniversary with a Jack in the Green on 22nd April 2006 and the Jack is now an annual tradition as part of an annual May Market. The Winchcombe (Gloucestershire) Jack was revived on August 31st 2009 as part of “Marking the Year.” A Jack was recorded as visiting a local school by Emma Dent of Sudeley Castle in the 1890’s. The Jack was then resurrected for May Day 2010 and a local May bank holiday village fete and is now awoken every year at dawn on May Day by Happenstance Border Morris and appears at various events in the following days. The Tunbridge Wells Jack-in-the-Green is a new Jack. He first went out on 30th April 2010 and has was seen out and about beating the bounds in 2011 and 2012 but did not go out in 2013. Jack (wearing a crown of May blossom) leads a procession around the commons of Rusthall and Tunbridge Wells and is then slain to release the spirit of summer. He is accompanied by a number of drums and is flanked by a red flag and a flag of Kent. The Lands End Jack-in-the-Green first went out in 2011. He greets the Dawn at Chapel Carn Brea on May Day accompanied by Boekka Border Morris and sometimes by Penkevyll, the Lands End Obby Oss. The Yaxley Jack-in-the-Green is a brand new Jack. He lead the traditional May parade on May 18th 2013 accompanied by Sap-Engro and Copperface as well as an attendant wearing the original Ancient Order of the Foresters sash, worn in the village’s parades in the nineteenth and early twentieth century and a host of boggarts – the mischievous imps of Fenland lore. 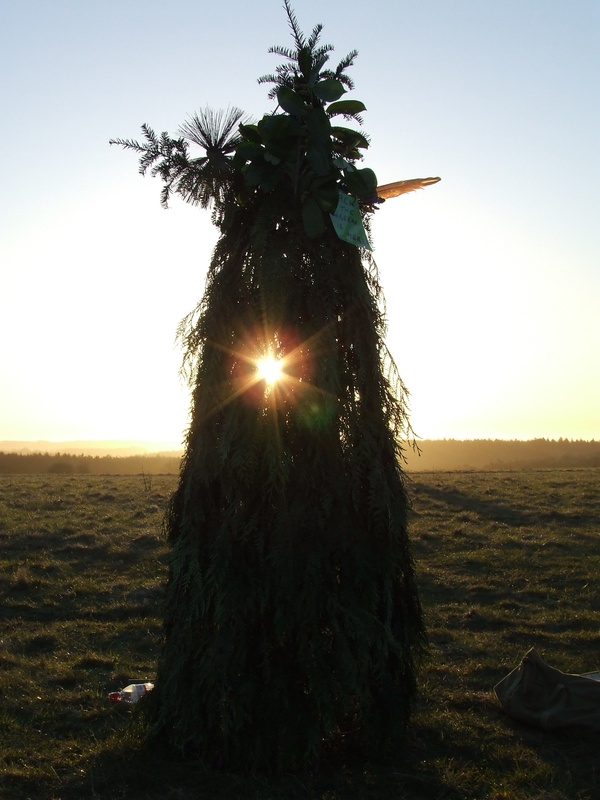 The Beltane Bash Jack-in-the-Green has not paraded since 2010. The parade used to start from the Conway Hall Red Lion Square London WC1 led by traditional giants, the Jack-in-the-Green and Bogies. I would love to hear from anyone participating or organising the current Pagan Pride Events who may know if a Jack will be participating again. It would be great to get pictures and personal accounts of as many of these events as possible for our archives. All pictures that are used on the blog or added to the Flickr archive are copyrighted to the original photographer and are never reproduced without prior permission. Our aim is to provide a living archive of all the wonderful traditional Jack-in-the-Green events that take place every year. The Oxford Jack was revived in 1951 by The Oxford University Morris Men. At the time they were unaware that it was a revival and that a Jack had appeared in Oxford before. Another revival appeared as a one-off in Hollington, near Hastings in the 1950s. This Jack was a small one built for a child as part of the May Day celebrations. 1974 saw the publication of Lionel Bacon’s ‘Handbook of Morris dancing’ which actively encouraged the revival and evolution of Morris traditions. Then in 1976 the Labour Government announced the introduction of a new May bank Holiday to start in 1978. May Day in 1976 was on a Saturday and in 1977, the year of the Jubilee, on a Sunday. All these factors provided the impetus for new Morris sides to form and for existing Morris sides to do something bigger and better than before. A number of revivals occurred seemingly independently within the space of a few years. In the mid-1970’s, Simon Garbutt built a reconstruction of a traditional Jack for a May Day celebration in Kingston and Surbiton, Surrey. His Jack was based on a photograph of May Day Festivities at Oxford by Sir Benjamin Stone c.1900. In 1976 Pilgrim Morris of Guildford created a contemporary May Day celebration using a number of traditional elements from various sources including a Jack-in-the-Green. The Whitstable Jack-in-the-Green was revived in 1976 by Dixie Lee and a local folk group for their folk festival. In the late 1970’s Morris dancers from various sides would gather to dance-in the summer on May Day in the Guildhall Yard, Leadenhall Market and various pubs in the City of London during their lunchtime. Dave Lobb and Greenwood Morris used to dance at dawn at Alexandra Palace, then bring their Jack into the City for an evening tour of London Wall and the Smithfield area. Dave Lobb and Mick Skrzypiec of the Earls of Essex Morris Men were discussing old May Day customs over a pint one lunchtime and decided to make it an all-day event and the concept of the City of London Jack-in-the-Green was born. In 1983 Mo Johnson made a Jack-in-the-Green in the back garden of the ‘Dog and Duck’ and Blackheath Morris (a side morphed from the Blackheath Foot’n’Death Men who used to dance at events featuring bands like Hawkwind and the Pink Fairies) revived the Deptford (Fowlers Troop) Jack. Mo was inspired by one of Thankful Sturdee’s photographs c.1900 of the original troop and Jack. On May Day in 1984 the Earls of Essex Morris, with Mick Skrzypiec in the Jack, met at dawn on Wanstead Flats to see the sun rise. After breakfast they travelled by commuter train into Liverpool Street and started the first City of London Jack-in-the-Green procession. They were joined at the Magog’s pub in Milk Street by Blackheath Morris’s Deptford (Fowlers Troop) Jack and a Jack carried by Mike Mullen of Hammersmith Morris. On subsequent occasions they were joined by the Jack from Royal Liberty Morris and members of other Morris teams and the Grand Order of Guisers (GOG) with Alan Pearson carrying the Greenwood Jack. The Bluebell Hill or Rochester’s Sweeps Jack was revived in 1981 by Gordon Newton as part of the Sweeps Festival. The Hastings Jack was revived by Keith Leech (formally of GOG and the Earls of Essex) in 1983. The Rye Jack-in-the-Green was briefly revived by Daisy Roots Morris dancers from Hastings. John Major’s Conservative Government tried to remove the new Bank Holiday in 1993. A group made up of representatives of all the active Jacks protested at Parliament. The Rochester Jack danced in Downing Street and the Hastings Bogies (Jack’s mischievous attendants) were allowed access to Parliament in full Bogie costume. It was most likely the appearance of the Bogies that caused the government to back down (I like to think so anyway). In Oakhanger, Hampshire in 1991 a Jack-in-the-Green was an addition to a new local tradition of Bower Decking that was started in 1988 by the local community and morris dancers. Jack led the procession. Bristol (a scion of the Hastings Jack) was revived by Pigsty Morris in 1992. Ilfracombe has had a Jack since 2000 and many other places have since followed suit including High Wycombe, Highworth, Winchcombe, Tunbridge Wells, and Lands End. A Jack has also been known to parade in the Pagan Pride Parade or Beltane Bash. 2013 saw a brand new Jack go out in Yaxley Cambridgeshire. There are also a small number of Jacks who parade privately in the UK each year. The modern Jacks are often accompanied by musicians and Morris dancers or attendants sometimes known as Bogies dressed in green rags adorned with leaves and flowers and with their faces arms and hands covered in green paint. Some Bogies interact with those watching the proceedings as the Jack is paraded by handing out small gifts to children or by adorning the watchers faces with some of “Jacks magic” which to the uninitiated may look remarkably similar to green face paint! Some Bogies like those at Hastings are particularly fierce and will protect Jack from the unwanted attentions of those who get too close to Jack before he wakes or try to steal leaves from him during the procession. Jack often dances and cavorts along, sometimes chasing those he takes a fancy to or who simply get in his way. He has also been known to have a voice on occasions and has been heard by the author to shout the words “bogey, bogey, bogey” before trying to invite himself into someone’s house. This article is the basis for a forthcoming book on the history and revival of the traditional Jack-in-the-Green. It is a work in progress and I would be very grateful to hear from anyone with any corrections or further information about historical or modern Jacks. The sun is shining in the UK and it would appear that Spring has finally waded through the flood water to put in an appearance! The tradition of the Jack-in-the-Green most likely stems from the creation of intricate garlands of flowers during the 17th century which were carried by milkmaids during May Day celebrations. Over time the garlands became more elaborate until milkmaids would sometimes be seen balancing garlands on their heads covered in huge quantities of silver household objects. As guilds and other trade groups became established they joined in and tried to outdo the other participants in an attempt to receive more coins from the watching crowds. It was probably the Sweeps Guilds intent on earning as many coins as possible, to help them through what was traditionally the quietest part of their year, who first expanded the size of the garland to such an extent that they came up with the idea of the all covering structure, now known as the Jack-in-the-Green. May Day was traditionally a holiday for the Chimney Sweeps and became known as “Chimney Sweeper’s day.” The connection between the Jack-in-the-Green and chimney sweeps continues today. Some organisers and participants still have direct or distant connections with the trade. The character of the sweep is a participant in many of the current Jack-in-the-Green parades or is represented by his accoutrements (the sweep’s brushes) or blackened sooty faces. Varied musicians became involved as did dancers, mummers, Morris dancers and a host of strange characters including the Lord and Lady, clowns, men dressed as women, blind fiddlers, dragons, the “traditional” fairy on stilts and a number of named characters. These included Black Sal, Dusty Bob, May Day Moll, Grand Serag, Jim Crow, Master Merryman and Maid Marian. The earliest known record of a Jack-in-the-Green is from The Morning Chronicle and London Advertiser of 2 May 1775. “Jack of the Green had made his garland by five in the morning, and got under his fhady building by seven…” By the early 1800s the Jack-in-the-Green had spread from London following the rapid unregulated growth of the chimney sweep’s profession through the suburbs across the south of England and beyond. Most towns had at least one, and often many sweeps many of whom paraded rival Jacks on May Day. From the mid1800s May Day celebrations and the Jack-in-the-Green began to die out. Victorian sensibilities clashed with the bawdy working class practices involving the Jack-in-the-Green. Newspaper reports of the events became increasingly negative and disparaging of the general mayhem and at times riotous behaviour that ensued at these events. In 1875 the Chimney Sweepers Act was passed. The practice of sending boys up chimneys was banned and all chimney sweeps had to be registered with the police. The Sweeps May Festivities were changed irrevocably and by 1875 the heyday of the Jack-in-the-Green was over. By the early years of the 20th Century the Jack-in-the-Green had all but died out across the UK. From the mid-1800s a number of Jacks were already tame ’revivals’ or even replacements created by the Victorians to become a part of their own more genteel May celebrations of the English Idyll.